Pablo Picasso (Spanish, Cubism, 1881–1973): Les Demoiselles d’Avignon, Paris, 1907. Oil on canvas, 8′ x 7′ 8″ (243.9 x 233.7 cm). Museum of Modern Art, New York, NY, USA. © This artwork may be protected by copyright. It is posted on the site in accordance with fair use principles. 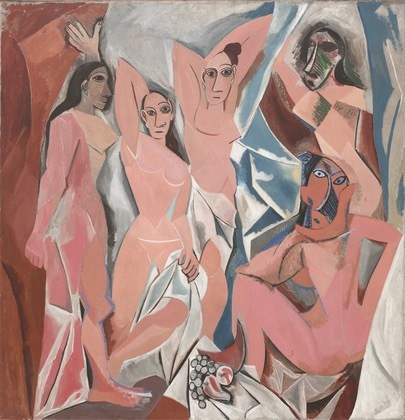 ‘Picasso painted “Les Demoiselles d’Avignon” after encountering African masks and Iberian sculpture at the Palais du Trocadéro, a Paris museum … Picasso, like many of his contemporaries, drew inspiration from non-European art. African masks, with their radical simplification and stylization of human features, suggested an alternative to conventions of Western painting and representation, and challenged artists like Picasso to develop new forms of representation.